Alexandria Ocasio-Cortez, the youngest woman. At age 29, she was able to become the youngest woman to enter Congress. The Democratic star of the legislature won by wide advantage in the 14th district of New York. Exactly one year ago she was a waitress in a Mexican restaurant and today she is one of the most relevant emerging figures of the Democratic Party. The Bronx's Latina managed to beat Republican Anthony Papas without difficulty, despite not having gone through politics and the support of big financial powers. Jared Polis, the first homosexual governor. The politician, businessman and philanthropist, unlike Ocasio, had a large budget and his own pocket. The Colorado Democrat has managed to be the first openly homosexual governor in the United States. Polis, 44, has an estimated net worth of nearly $ 400 million ($ 1.5 billion). New Jersey Democrat governor Jim McGreevy, who was elected in 2001, declared himself a homosexual while in office. 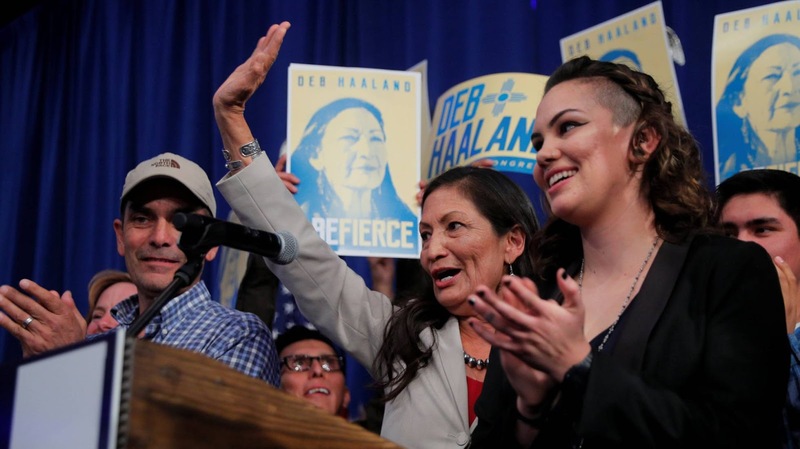 Deborah Haaland and Sharice Davids, the first indigenous people. Native Americans have achieved something unheard of. The Congress never had an indigenous one among its representatives in its more than 230 years of history and in that election two managed to enter. One of them is Deborah Haaland, the new legislator from New Mexico. Haaland, 57, belongs to the Pueblo de Laguna tribe, one of the 566 legally recognized in the country. With a victory that reached 60% of the vote, the Democrat took a step forward in politics after nearly two decades behind the scenes. The other is Sharice Davids, a Democrat from Kansas who is the first openly and openly lesbian woman to come to one of the Chambers. The 53% vote she received allowed the lawyer to enter Washington triumphantly. Rashida Tlaib and Ilhan Omar, the first Muslims. The Muslims, who had never been represented, also obtained a double victory. Democrat Rashida Tlaib, the daughter of Palestinian immigrant parents, won in Michigan. Even without an opponent because the Republicans did not present a candidate, the merit of the 42-year-old lawyer is historic, among other things, for breaking with the establishment set up in her own party. Ilhan Omar, a Muslim, also became the first US legislator of Somali origin. The 33-year-old Democrat fled with her Somali war family, lived for four years in a refugee camp in Kenya and arrived in the United States when she was 12. Ayanna Pressley, Massachusetts's first black congresswoman. Another candidate who had the right win for not having competition. Pressley, a Chicago native, is the first black legislator in Massachusetts. It belongs to the progressive wing of the Democratic Party and was the great surprise of the primaries when it overthrew Michael Capuano, a politician with 20 years of experience in the Congress. She was a victim of sexual harassment as a child and at age 19. "None of us ever had a history. We are challenged to make a change, "Pressley said Tuesday in his thank-you speech. Marsha Blackburn, the first senator in Tennessee. The Republican is the first elected senator in Tennessee. Blackburn, 66, was in the eye of the storm during the appointment of Supreme Court Justice Brett Kavanaugh, whom he supported despite social polarization in his state on the subject. He supports the construction of the wall on the Mexican border, Trump's anti-immigration laws, and the punishment of American football players who kneel during the anthem. Taylor Swift's request that voters not vote for her did not work, as she beat her competitor by more than 10 points. Veronica Escobar and Sylvia Garcia, Texas' first Latina legislators. The two Democrats achieved overwhelming victories. In that way, they will represent Texas in the United States House of Representatives. Although Latinos make up nearly 40 percent of the state's population, Texans had never elected a Latina woman to Congress. One of the favorites on the list was Democrat candidate Andrew Gillum, who was to become Florida's first black governor but lost nearly four points off Republican Ron DeSantis.